We stayed up to welcome in the new year, but learned our lesson after last year and watched the fireworks going off over Calton Hill from our back window. It was spectacular and wonderful, but, again, it was kind of short – less than 4 minutes, start to finish. Still, it’s the thought that counts (though in this case the thought was mostly, “Oh, is that it?”). 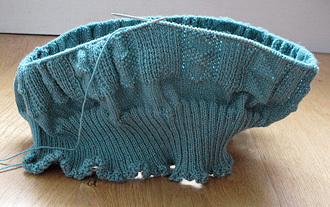 As you will see from the photos, I’ve started the pattern for the body of Margaret’s cardigan. We decided on a combination of a couple of Scottish patterns, recorded in Gladys Thompson and Michael Pearson, which caught Margaret’s eye. One is the half-flag, a triangle which also appears in the splendid Mrs Laidlaw of Whitby’s pattern. This is 13 stitches wide, 11 for the pattern plus 2 plain stitches for the edges. The other is a diamond, and it’s a little unusual, and comes from Mrs Stevens of Cruden Bay (see Pearson, page 63). 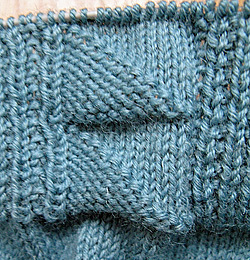 The diamond is knit in plain stitches, but is surrounded by moss stitches, instead of the other way round as is more common. It makes for a nice effect, though I’ll need to knit more of it to really bring it out, but it is pretty fiddly. (There’s a lot of counting to make sure the purls land on the right spot, and let’s be honest here, rows of knit-purl-knit-purl do rather slow you down. But then, to paraphrase a wise man talking about Wagner’s Parsifal, people in a hurry shouldn’t be knitting ganseys in the first place.) The diamond panels are 27 stitches wide, including a plain knit border stitch at either side, and the diamond is 9 stitches across at its widest point. The 2 panels alternate around the body, 5 diamonds and 4 half-flags to each side, so that the centre of the front and back falls on a diamond. The panels are separated by a moss stitch delineator consisting of 3 stitches (purl-purl-purl on odd rows, purl-knit-purl on even rows). This blends in happily with the moss stitch of the diamonds. Oh, and the patterns have been tweaked to ensure that they each finish on the same row, to make it easier to keep track of repeats up the body. Well, let me be the very first to inaugurate your new 2011 Blog! YEAHAHAHA!! Now with the celebratory horns put away, I want to ask you what in heaven’s name is “Archbishop of Canterbury’s book on the theology underpinning the novels of Dostoevsky” and why in the world would any sane person want to cogitate such a subject much less write or read about it. Personally, I think we give too much credit to Mr. D. As with James Joyce, I never had a high enough IQ to get to the end of his book much less figure out the underlying themes, motives and symbols. You are absolutely right, give me a Pratchett or a Jim Butcher any day. And as for this year, my mantra will be continued from Jan 1, 2010, “This will be a better year than last year, this will be a better year than last year, etc., ad infinitum. P.S. Forget to say the most important thing…Love the sweater, love the color. Margaret is one lucky lady! Happy New Year to you. Good use of horns there! Anyway, since I’ve always been fascinated by the Archbishop of Canterbury’s eyebrows (look up images of Rowan Williams on Google and you’ll see what I mean) I thought it would be interesting to see what his thoughts on all this were. I’ll let you know how I get on! Errr, Gordon, you wouldnt be one of those high-flutin’ Eng-Lit/World Religions-Philosophy-type university professors or anything, would you? Hmmm…Woody Allen, Archbishop’s eyebrows, 2001 Space Odyssey-shaped bread, yeppers you are way above my learning. In my best Monty-Python-announcer voice, “And Now for something completely different..”, knit 1, purl 2. P.S. Yeah, I had to google. You’re right, I do see a hint of Spock in the Archbishop. No, I just have too much time on my hands! And yes, knitting is great because it’s a practical skill, like making bread, or lacemaking, or carpentry, or cooking, everything you make is unique and (usually) special, one way or another. No matter what goes on in your head, there’s nothing quite as satisfying as making something with your own hands, is there? Well, other than England beating Australia at cricket, of course! That’s an interesting choice of patterns. I think I read that the half-flag triangles tend to create vertical pleats, which might pull in gently, almost like ribbing, for a snug fit. Part of the idea of the pattern is to give us some flexibility in sizing – it’s a while since I knitted with Frangipani yarn, which usually knits up quite tight, around 9.5 to the inch. But my recent ganseys have been closer to 9.0. So, I’ve included a number of purl rows which we may end up using as pleats just in case the gansey ends up too big. Happy New Year, Gordon – and all. 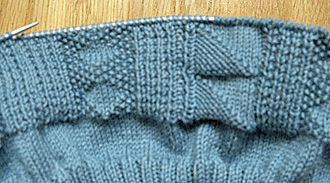 Gordon, your gauge of 9.5 to the inch (I’m assuming on your usual 2.25 mm needles) – is that gauge done on stockinette st.? or your pattern ? You usually don’t do a swatch, do you? 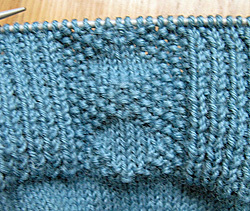 When you finally do the steek, do you fold those knit stitches to the wrong side like a facing? and then, is the binding a ‘pick-up-and-knit’? Hi there, Lynne, happy new year! 1. Yes, the gauge is on standard 2.25mm needles. 2. I base my gauge on the average number of stitches per inch of the last gansey I knitted, once it’s been finished, washed and blocked. So it’s an average of 400+ stitches. (There’s no doubt that having a pattern makes my stitches bigger – but then cables draw them in again so it kind of balances out… I think?) By now I’ve got a pretty good idea of my gauge, though. 3. I don’t usually do a swatch because I’m (a) lazy, (b) not convinced that a swatch on dpns is an accurate reflection of my actual knitting on circular needles and (c) did I mention I’m lazy? You are much braver than I am in attempting the steek, but lazy?, yes, I can relate to that as I am not going to waste my time doing the swatch in the round! I have last year’s Frangipani that I can guess and tweak with. I haven’t started the Claret Frangipani yet, hoping a bicepital tendinitis will settle on it’s own, but also knowing I will aggravate it again once I start the project – or – maybe it’s a little procrastination. Having fun with teddy bears in the meantime. Fun with teddy bears sounds good, tendinitis less so. I’m going to be hors de combat for a few days now as I am (hopefully) going to have my septoplasty operation tomorrow morning. (Apparently bobbing for apples isn’t recommended for the first few days, either.) So apologies if I don’t reply to any posts for the rest of the week. Good luck with the op, Gordon. Like you, my 2010 wasn’t my best year ever, but I made it through and my business is picking up so I’m cautiously optimistic. So I’ve started cogitating on the christmas 2011 gansey for my other half. When I suggested this, he was keen, so I sent off for a colour card, fully expecting him to choose one of the four shades of blue on offer. After a mammoth 2 weeks thanks to the snow, the card arrived and to my surprise he chose olive. So now I’m scouring pattern books, old photos etc, along with your wonderful website, thanks for that. P.S. 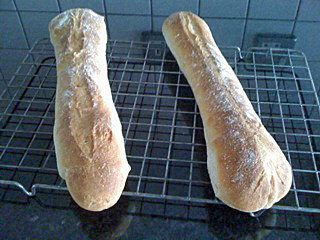 I too have produced baguettes of the shape on the right, plus one with a funny bulge in the middle. Weird, when they start off evenly! Hi, Gordon. I hope your operation went well. I, too, found that first literary book on Pratchett essentially unreadable. Oddly enough, the second edition of the same title had many completely different essays, many of which I felt were much better. If you should have a chance to find it in the library, it might be worth a second chance. I started knitting guernseys as a beginner – I wasn’t interested in the whole “fat needle” thing. And besides, in the old days, traditional knitters just got stuck in,because that’s what they knitted, far as I can tell. So – for what it’s worth – if it were me, I’d just go for it, and get stuck in with with the guernseys. Whatever you do, you need practice to get good at it, so your first attempt may not be quite as successful as you’d like. But one advantage of ganseys, they’re so fine, whatever you do tends to look impressive! So, advice. Get a ball of gansey yarn and some 2.25mm needles or thereabouts; have a go at a swatch or two, and practice some of the simple patterns, just to get the feel of it, and to get an idea of your stitch gauge. Then go for one of the patterns which is plain knitting up to the yoke, such as the Cornwall or Patrington examples in my gallery (I’d recommend this because you can really get into your stride with plain knitting, and as a beginner confidence is important – and it goes much faster than a complicated pattern!). I hope it works out – please keep in touch, and let me know how it goes, and if I can be of any help whatsoever – unlikely, but you never know – please don’t hesitate to get back to me. Also, there are some very experienced knitters who drop by on this blog, and if you have a question they may be able to offer advice too.